You were the keynote speaker in the Spanish program at the 2014 OCD Conference in LA. Tell us more about that. What inspired you to get involved in the conference and present this big speech? And I needed to see the faces of other OCD sufferers. See if their eyes were as brilliant and terrified as mine. However, as much as I wanted to go to Atlanta, I couldn’t travel on my own and the conference dates were around the corner. But we stayed in touch and determined to meet next year in Los Angeles. The IOCDF became one of the most important affective landmarks for me as an OCD sufferer. That is why being the keynote speaker for the Spanish program was not only an honor but also an empowering and healing experience for me. What do you hope your audience took away from your presentation? I strongly believe in nurturing and revealing the uniqueness of the individual that resides underneath the OCD “coat.” That’s why one of my main goals as an advocate is not only to raise awareness about stigma, seeking help, and accessing the right treatment, but also to encourage sufferers to trust their creative identity. I think that there is great therapeutic value in addressing each person’s true dreams and goals in life and helping them find the will and determination to achieve them. During my speech I performed a live exposure because I wanted the audience to have a taste of how effective ERP can be, but I guess most of my presentation centered around the importance of dis-identifying form the symptoms and addressing each one’s uniqueness. Probably that is why I started the keynote singing a capella. So I hope the audience took away a sense of hope and a stronger trust in themselves. You were also in a panel I attended called OCD in the Media. You and other panelists discussed common misconceptions about OCD that are perpetuated on TV and in movies. One thing you said really struck me: Before you agree to interviews you make sure you’ll have a chance to talk about OCD. When did you come to this decision, and how? Have you ever gotten a negative reaction to this requirement? Sometimes journalists or media people would try to overshadow one aspect over the other, and it might be reasonable given the nature of each show. A music radio show would probably want me to talk about music. Sometimes OCD looks like a “boring” or unpopular topic, or inversely, they would want to address the bizarreness of the symptoms instead of talking about my songs. I usually say what I need to say. And even though I might politely stick to their preferred topic, I feel so comfortable with this integrative approach of things that I just bring any subject up when I feel it’s right to do it. I loved the song you wrote for the conference, “My Inspiration.” Do you ever slip in references to OCD or your struggles in your Spanish pop songs? Oh, I’m glad that you liked the song! Surprisingly, I don’t typically write songs about OCD. I wrote two songs inspired by my group-mates at the OCD Center of Los Angeles, one of which is actually “My Inspiration.” I think I once tried to write some OCD themed song in Spanish but never finished it. I’m sure, however, that OCD has slipped into some of my songs, at least tacitly or indirectly. What obsessions and compulsions have you had over the years? Was there one obsession or compulsion that was harder than others to deal with? I have had contamination intrusive thoughts as well as superstitious intrusive thoughts, and scrupulosity intrusive thoughts. Cleaning compulsions include hand-washing, compulsive laundry, great difficulty with cooking, storing food, avoiding the out-doors or touching people, among a long list of other compulsions. Superstitious rituals would involve walking back and forth, locking/ unlocking doors, spiting “bad food,” re-washing items, etc. One contamination intrusive thought literally expelled me from my own house. And yes, it is still resistant to ERP, at least in the sense that I still have trouble with visiting my tenant-friends in that house. It is sad, because I love that place, but it was also where I spent most of my worst OCD times, which obviously affected my relationship with that place. When were you diagnosed with OCD? How are you doing now? If you’ve had relapses, either big or small, can you share how you’ve dealt with them? Do you have any methods for preventing relapse? I had big relapses. My last relapse was really bad. It was in between two trips to Los Angeles. I remember that my parents would come pick me up, drag me out of my place and take me to the restaurants. Otherwise I would not eat. I was diagnosed with malnutrition and would wear wet clothes most of the times. 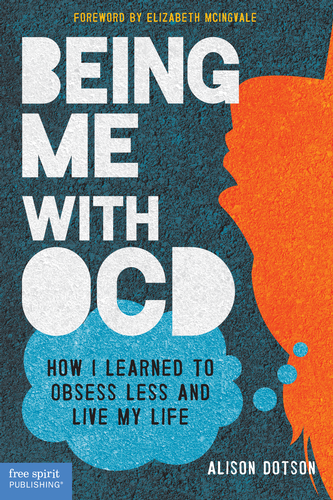 My OCD had gotten so bad that I remember experiencing intense confusion and having trouble with the most basic tasks, such as drinking, eating or dressing. Fortunately, my family and I made a life-altering decision: I would travel to LA for an intensive CBT/ERP treatment. I haven’t had any relapse after that intensive, so far. My only method for preventing relapses is accessing the strong emotional foundation I have built through treatment. I have developed habituation, but not only in the sense of “learning healthier habits as a replacement for compulsions.” I also habituated myself to anticipating the OCD cycle in a way that I can fall and even “hurt” myself, but then I know how to get up, shake the dust off my knees and keep walking. I engage myself in a lot of natural exposures as well. That means, I push myself to do exposures almost every time that an OCD fear interferes with a random task. In fact, I seem to do better with natural exposures than with some old obsessions that I usually can hardly tame, even through therapeutic ERP. That doesn’t mean that natural exposures should replace therapeutic ones. In fact, it is extremely important to keep doing traditional therapeutic ERP as maintenance. I can’t wait to see it either! So this is the news: I’ve teamed up with a pretty successful and well-known video-clips director in Argentina and we are doing a whole new documentary! We’re hoping to have it done by July and premiere it at the conference. You recently got involved with the A2A Alliance. Can you tell us how that came about, and what you’re doing with the organization? It all started when I met Jeff Bell at the IOCDF’s 2014 Conference in Los Angeles. I remember I was about to join the OCD in the Media panel, which was my first participation at the conference. I was so nervous and excited, and didn’t know how things would work out. Jeff came up to me and we had the most pleasant and encouraging first conversation. One thing led to the other and all of a sudden we found out we had the same way of thinking about OCD awareness, even though we were born and raised thousands of miles apart. I felt such a bond and connection with this new friend, this new ally, that I guess it’s not by chance that he runs such an inspiring and wonderful organization: A2A is a great concept put into action. It gathers people that were able to turn adversity into advocacy. Yes, that magical and empowering transition that often helps find meaning to our struggles by being of service to someone that’s battling the same adversity. I’m honored to have been given the opportunity to become an A2A advocate. If you could give someone with OCD one piece of advice, what would it be? I would suggest seeking help in the first place. Of course I mean specialized help (CBT/ERP therapy). Secondly, it is important that people suffering from OCD understand that they are not their disorder. OCD is not a personality trait, not even a personality disorder. We need to dis-identify from our symptoms and focus on our CBT/ERP treatment. I would also encourage OCD sufferers to talk about their disorder. There is nothing to be ashamed of or feel embarrassed about. As I said, our symptoms do not define our identity. One way of breaking stigma is letting people know about our OCD instead of trying to hide its manifestations. In sum, OCD can be treated, sufferers can actually get better and enjoy more functional lives. There is no need to hide; in fact, the more we talk about our OCD the less OCD will speak for us.